We are open ALL days from 12:00 noon to 12:00 midnight with last kitchen orders at 11.00pm. Full menu throughout the day. The Indian term Sharma means ‘happiness’ or ‘joy’, so we felt it was a great fit for our Indian & Ethnic Restaurant. We aim to please all our customers and we do so by creating an enjoyable and delicious dining experience. 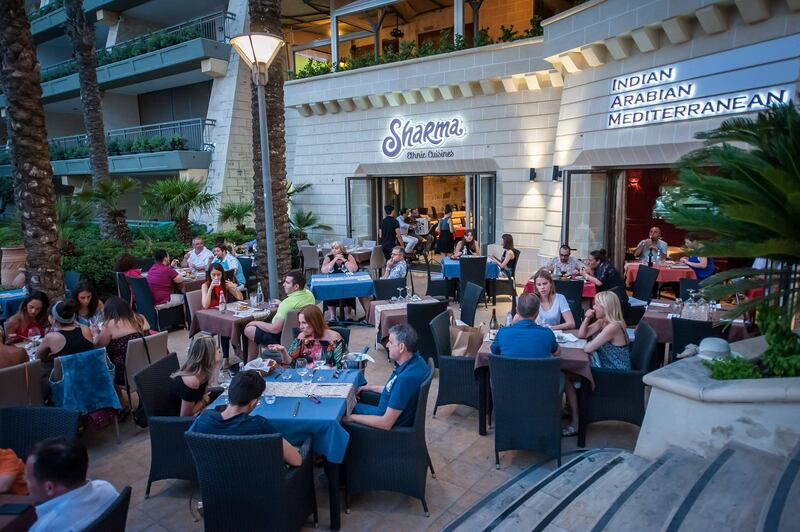 We are delighted to have reviews stating we are one of the best Indian restaurants in Malta! We feel that our authentic Indian ingredients, vast menu of typical Indian dishes and our passion for good food and great service really set us among the best. “Well, one thing can be said for this place, which is Fantastic. This was my first time trying an Indian cuisine, and certainly it did not disappoint…. In addition to providing an excellent experience dining-in, we are also pleased to offer an Indian take-away or Indian food delivery service around all Malta, to allow you to enjoy our authentic Indian dishes at home. Besides being an Indian Restaurant, Sharma St. Julian's serves a good selection of authentic Arabian dishes as well, making it an Ethnic Cuisine. Hence aside from our popular curry & Indian-spiced dishes, one can also enjoy a selection of Arabian appetizers such as Dolmah & Falafel, Arabian main dishes from our grill including koftah & kebabs, and other traditional stew dishes seasoned with Arabian spices! Guests enjoy choosing from our varied menu of Indian, Arabian & Mediterranean dishes, because no matter who you visit Sharma with, there is something to please everyone. We proudly serve traditional Maltese dishes such as rabbit stew too! Of course other Mediterranean dishes including several pasta options and a variety of salads are also available on our menu. Our dessert menu offers a range of sweets from around the world – Maltese Imqaret, Indian Ice Cream and platters of Arabian sweets – letting you try something new each time you visit. Moreover at Sharma St. Julian's we observe halal practice! Sharma is the ideal place for Muslims to enjoy a meal as we have done everything possible to create a wonderful atmosphere and a varied menu of classic Indian, Arabian and Mediterranean halal dishes. Our entire restaurant is pork free, our chefs are halal trained and our kitchen is run in a halal way. We work carefully with our suppliers to ensure that all of our food products are halal too. Our beautiful location at Portomaso lets you sit inside or outside, depending on your preference, and enjoy views of the marina. 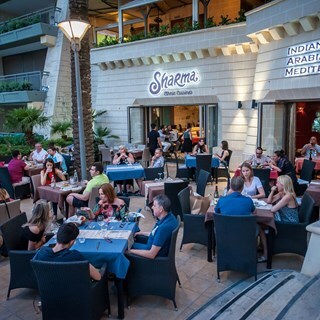 Our St. Julians location is ideal for tourists staying in Paceville area, and any part of St. Julians and Sliema, all of which are within walking distance to enjoy a leisurely stroll home after your meal. If you prefer to drive or are visiting from further afield, we are pleased to confirm that parking at Portomaso car park is free for 2 hours. We look forward to having you join us very soon! I really was pleasd and sure would recommended. First time we have visited the restaurant, we had the buffet and would highly recommend it. Only one slight moan, and that the food could be a bit hotter. Very well served, good food and good value for money! Pity that the buffet curries were mostly just that with no or little meat. One of the buffet mains was finished and not refilled even though there was an hour to go to the buffett lunch. Brilliant service, lovely food and a good vegetarian selection. Will definitely be returning! The chicken tikka masala was delicious but was a bit disappointed by the Korma, madras and Rogan Josh. Very nice setting and friendly atmosphere, and good value for money especially considering it was Sunday lunch. It's always a pleasure to visit Sharma. The atmosphere makes you relax. The persons in charge are always professional and do their best to serve you. The food is absolutely delicious. What else could I ask for? Good selection of dishes in the buffet. Location is great and parking vouchers for Portomaso parking a great extra. The food was very good & the servers were just amazing. Very friendly but also professional. We went for Buffet lunch. Food was okay type. Not that much varieties as should be in buffet. If you want to try for 1 time then okay. For me 2nd visit for buffet most probably never. Menu dishes are so much expensive as per Maltese Law. Naan Bread was so hard. Tandoori chicken was old hard chickens leg pieces. No any normal desert in buffet dish. For vegetarians no any option in buffet. only one curry and some fries. Enjoyed a fine lunch with family. Nothing to complain about, but maybe the seating time could be extended to 2 hours. Apart from that we were very satisfied. Will surely visit again. Excellent service at Sharma last Saturday, will go again for sure! Wonderful experience.. Food was excellent..
A great place for a relaxed superb dinner!